Objectives: To evaluate the differences between homemade and from the box cupcakes and frosting. Set: Tell the class the essential question and set up the experiment verbally before beginning. Are homemade cupcakes and frosting better than from the box cupcakes? You can even ask your students to determine beforehand which is better then reevaluate their conclusions after tasting the finished products. One group makes both the vanilla and chocolate frosting. The rest of the groups make each of the different cupcakes either from scratch or from the box mix. I highly suggest that each group puts their cupcakes in different colored muffin liners. 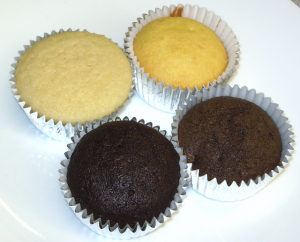 This helps the students distinguish between homemade and box mix cupcakes during the evaluation. Students should time themselves to see how long their recipe(s) take. This information is needed for the evaluation. When students are waiting for their cupcakes to bake they should start the cost analysis part of the lab report. Students will make the cup cakes and frosting. Students should sample the homemade and box mix cupcakes and write their analysis in the chart. Which cupcake do you think is better? Which cupcake is better to make if you are in a hurry? Are any of these cupcakes really better than the others or does it depend on the variables like time, money, taste that are important to you?